"Écolibrium" (Image/Liz Pacheco)As you might have already heard, the corner of 20th and Market has been transformed. About a month ago the space was a fenced-in vacancy, covered in weeds and trash, a more than 20-year-old eyesore in Philadelphia’s business district. But now, amidst the skyscrapers of Center City, stands what Pennsylvania Horticultural Society (PHS) President Drew Becher calls a “billboard” for urban gardening in Philadelphia. This 32,000 square foot garden, known as “PHS Pops Up,” is home to a variety of flowers, herbs and produce. 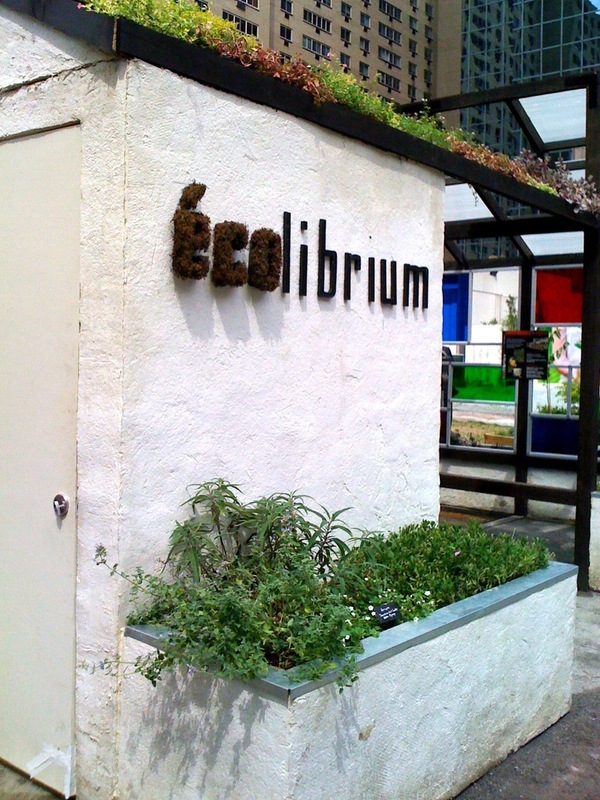 It also hosts “Écolibrium,” an exhibit of sustainable building and gardening in the style of Dutch painter Piet Mondrian. The piece was created by Temple University Ambler students for the 2011 Flower Show. Seedlings came from the PHS prison program where inmates learn how to grow vegetables and other plants, shrubs and trees were donated. The wood used for raised beds and benches was found on site and PHS volunteers put the garden together. The project is a collaboration among PHS, Brandywine Realty Trust, and Independence Blue Cross, with funding from the William Penn Foundation. PHS Pop Up at 20th and Market (Image/Liz Pacheco)The “pop up” aspect of the garden is no exaggeration; the project came together in only a couple months. But, the garden will only exist until late October, when it will be deconstructed, only to “pop up” in a new location next spring. During open hours, PHS will host free tours and classes, like canning, composting, container gardening, and organic pest control. Unfortunately, the garden is only open on Wednesdays and Thursdays from Noon-2 p.m., a small window for the city to experience this unique space. The garden will also benefit City Harvest, a PHS program that brings fresh produce to Philadelphians through community gardens. Garden produce and herbs will be used in signature dishes at six city restaurants (R2L, Square 1682, Table 31, Sampan, Barbuzzo, and Paradiso) with proceeds going to City Harvest. “It’s going to bring attention to locally grown food and access to food in a way nothing else can,” said Steveanna Wynn, executive director of Self-Help and Resource Exchange (SHARE), a food distribution, education and advocacy program that partners with City Harvest. The speed at which the garden was created is impressive, and the goals of sustainability and food access awareness are admirable, but the pop-up concept is frustrating. When the garden is disassembled in October, what will happen with the space at 20th and Market? Could Center City, as a community, benefit more if the garden was long-term?